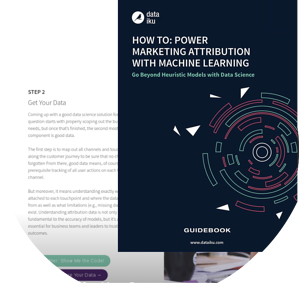 Tackle one of the biggest challenges faced by marketers today (effective marketing attribution) with this step-by-step guidebook. Marketing attribution is the perfect space for data science because it can help incorporate vast amounts of data from various sources to help marketers understand in a scalable way and down to a granular level where the best (and worst) conversions are coming from. There is no magic bullet solution to marketing attribution, though employing machine learning techniques can significantly lower the time spent and deliver better results than traditional heuristic models. An in-depth look at common marketing attribution methods and the advantages/disadvantages of each. A step-by-step walk through on how to build an algorithmic attribution model, including code for technical users and explanations for non-techies. A look at common missteps in marketing attribution (+ specific solutions). Articles and interviews with experts.